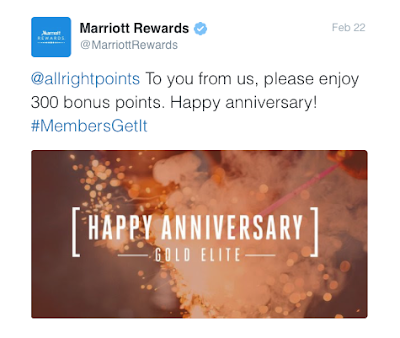 Marriott Rewards tweeted at me the other day to offer 300 Marriott Rewards points for my "anniversary." Not exactly sure what that means - I've been a gold member for 4-5 years thanks to credit card benefits and now am Marriott gold for life (assuming they don't change the terms) thanks to my Starwood SPG lifetime gold status. Certainly a nice and unexpected gesture (I value the points around $2.50) but the funny thing is that I don't have the points yet. I received the tweet on 2/22...it's now 2/25 and they haven't posted. You would think they would send the tweet on the day the points would post since that is fully in their control. Doesn't really matter - it's a nice gesture and I appreciate it. Earlier in the week, I posted about the 2,500 bonus point offer for adding an authorized user to a SPG Amex card. Good news - the points have already posted to my account. I added Emily as an authorized user on Saturday (7/23). The points were in my account on 7/26. This is a no-brainer promotion. While the offer is supposed to be targeted, I didn't receive any direct communication from Starwood or American Express and the points still posted to my account. So definitely worth giving it a shot for 2,500 SPG points. It is a free miles and points bonanza this morning here at ATRP. 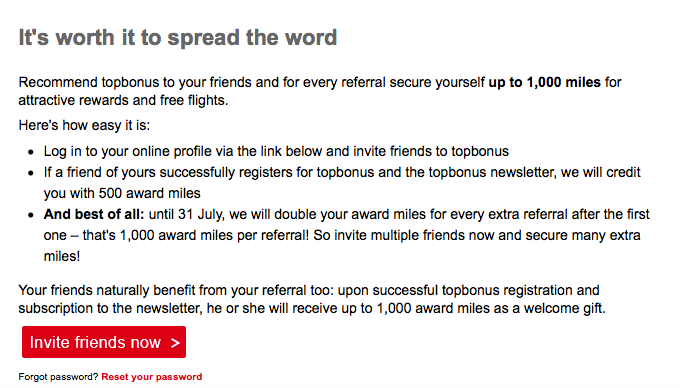 First, earn 1,000 Airberlin topbonus miles for referring a friend. 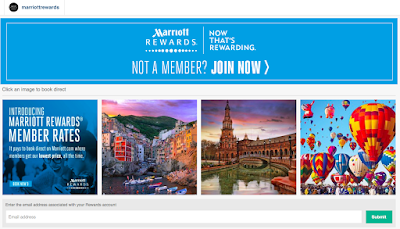 And third, earn free Marriott Rewards points for following Marriott on Instagram and submitting your email address at the bottom of this page. Bonus points should post within 4 weeks. I'm not entirely sure how they are matching up your Instagram account with your Marriott Rewards account. I would assume based on email address. 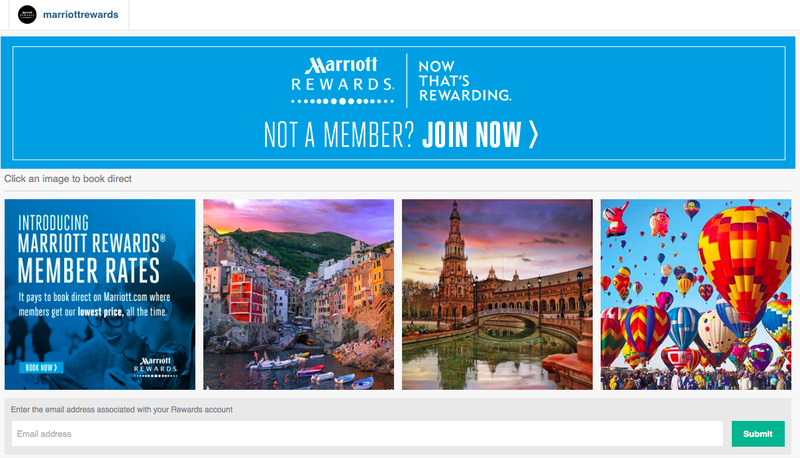 Just to be safe, you'll want to ensure your Insta and Marriott Rewards accounts have the same email address. You can also follow All the Right Points on Instagram and you'll get free pictures of our past/current travels. While 500 points isn't earth shattering, this one will literally take you <30 seconds. You have until 6/21 (Tuesday) to follow and submit your email address. You can earn 500 free United miles in about 3 minutes by adding your United MileagePlus credit card to your Visa Checkout account and making a $5+ purchase by 9/30/16. Note that you have to make the purchase within 15 days of enrolling. Apparently this is a targeted promotion (Emily had the promo but I did not) and only valid for new Visa checkout accounts. I have a feeling it will work regardless. To claim the bonus, click here to go to the landing page and enter your United MileagePlus number. You'll be asked to login to Visa Checkout to add your United MileagePlus credit card to your account. You'll be taken the confirmation page showing that you've been enrolled. The page has prompts to make a purchase at about a dozen Visa Checkout merchants but you can find the full (and much larger) list of merchants here. I enrolled both of our accounts and made a $10 Starbucks reload purchase with each Visa Checkout account. The points haven't posted, but I imagine they will in the next few days. This (in theory) is a quick and easy 500 United miles which I value around $10. So in the Starbucks reload scenario, you're basically getting the reload for free. I've never flown Airberlin although I'd like to - they apparently have a solid product and award availability is decent from the US. 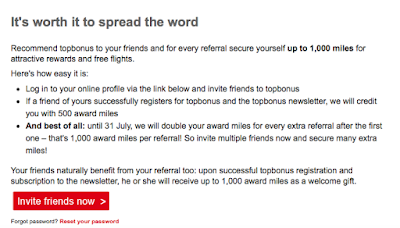 Their frequently flyer program (topbonus) is out with a fairly lucrative referral bonus where you can earn free points for referring your friends to topbonus. You will 500 miles for the first referral and 1,000 miles for the next 9 (you can make 10 referrals per year and the bonus is good through 7/31/16). That's a total of 9,500 topbonus miles - nearly good enough (10,000) for a free one-way economy flight within Europe. Your referral will earn 1,000 bonus miles for signing up. If you already have a topbonus account, you can create your own referral link here. While I've had an Airberlin topbonus account for a few years (not sure why) Emily has not. I went through the process of referring her and then creating her account. Within a few days, the points had been credited to her account (1,000) and mine (500). If you are interested in signing up for a topbonus account, feel free to use my referral link and we'll each earn 1,000 topbonus points. Free points are free points and the ability to earn nearly enough for a free one-way is a great deal. Flying within Europe is expensive and it's painful to burn hard earned United or BA miles (transferred from even harder earned Chase Ultimate Rewards) for an intra-Europe flights. I'd recommend signing up for an account and if you have a handful of interested friends, refer them as well. 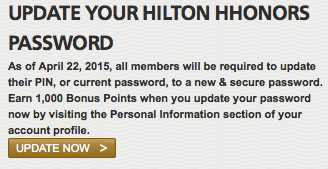 Hilton's loyalty program (HHonors) is offering each member 1,000 points for changing your password by 4/22/2015. Hilton is moving away from their PIN based system (4 digits) for security purposes. This will literally take 1 minute of your time. I value HHonors points at half a cent each so this is like getting $5 for free. I've changed my account and Emily's and both of our points have already posted. A few months ago, American Airlines offered an online game called the Passport Challenge Basically, you had to complete a few online activities and engage with social media to earn free miles. I earned 685 miles (worth about $14 to me) in about 5 minutes. Well 10 weeks later, my miles finally posted. I just logged on to my AA account and looks like they were credited as of 6/1. Yay for free miles! Emily and I both have the Chase IHG MasterCard (formerly Visa). This is another solid Chase card given that the annual fee is waived for the first year, $49 thereafter but you receive an annual free night to use anywhere in the world. So basically $49 will get you a night at the Intercontinental Hong Kong which regularly goes for $400 USD+. Chase recently switched from issuing this card as a Visa to a MasterCard. That's a pretty big coup for MasterCard considering Visa issues the majority of Chase cards. We both received our new cards this week with an offer for 1,000 points after first purchase on the new cards. 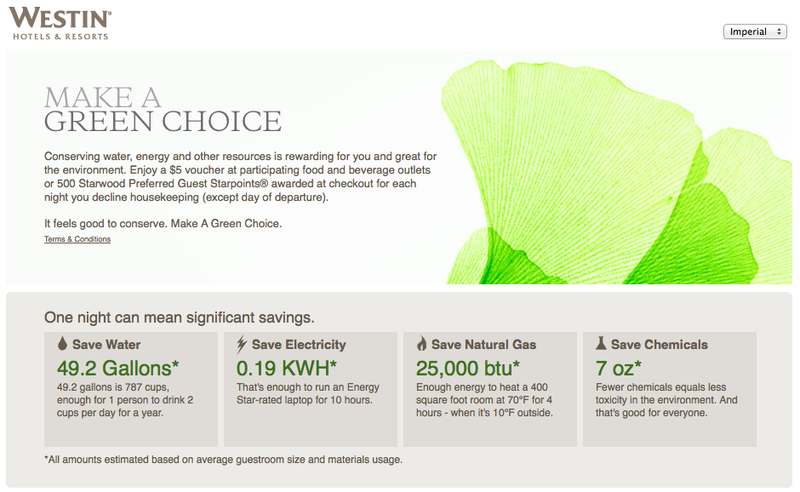 You can buy IHG points online for .7 cents each so this is a $7 offer. Still free points are free points. I will reload my Starbucks card on each of our cards to earn a total of 2,000 points. If you don't already have this card, it's worth considering. There is a link out there that offers 80,000 IHG points after spending $1,000 in the first 90 days. Couple that with the free annual night and at your one year anniversary you will have enough points for three (3) nights at a high-end Intercontinental. Certainly nothing earth shattering, but you can earn free miles by playing the AAdvantage Passport Challenge game on Facebook. This is essentially a Facebook trivia game (don't worry you get two chances to answer each question and they are pretty easy) about American's product offering. To play the game, click this link, register by adding your AAdvantage number and name, and you're off to the races. It will probably take 10-15 minutes to earn ~700 miles. Certainly notable if you are bored over the weekend (or on Friday afternoon at the office). 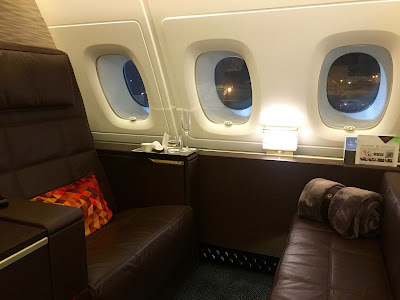 There is also an additional component to the promotion that includes bonus miles for flying on American and OneWorld partners over the next couple of months. Certainly worth checking out if your plans require travel on USAirways, American, or oneworld partners during the promotional period. Hyatt is offering 100 free points as a gift for Chinese New Year. Looks like it's supposed to be targeted but I tried it yesterday and my points (and Emily's) have already posted. I value Hyatt points at a $.02 so this is like getting a couple of bucks for free. The "activity" from the 100 points posting also resets the clock on points expiration. Offer expires 2/15 but will probably get pulled sooner than that. Some people scoff at spending the time to claim these offers but over time they really add up so I always try to take advantage if it's not too inconvenient/onerous to get the points. In this case it's really 10 seconds as you just have to enter your Gold Passport # and hit submit. If for some reason you don't already have a Hyatt account, you can sign up here and then grab the bonus.